bondhu vabo ki lyrics by topu is here for you. 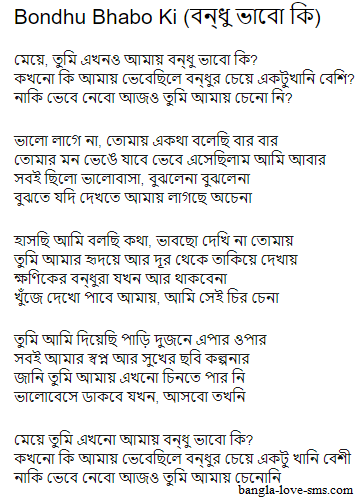 This song is very popular in bangladesh and all bangali. Topu is also most famus singer og bangladesh. He has so many bangla popular songs, and from them one of the most popular song is meye tumi ekhono amay bondhu vabo ki. So here i am writing the bondhu vabo ki lyrics by topu. Meye tumi ekhono amay bondhu vabo ki ? Kokhono ki vebechile bondhur cheye ektu khani beshi ? Naki vebe nebo ajo tumi amay cheno ni ? Bujhte jodi dekhte amay lagche ochena. Khujhe dekho pabe amay, ami sei chiro chena. valobeshe dakbe jokhon, asbo tokhoni. Kokhono ki vebechhile bondhur cheye ektu khani beshi ?